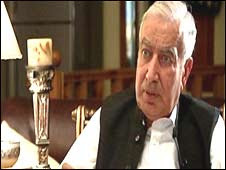 Chagatai Khan: Masood Sharif Khan Khattak on Brigadier Imtiaz Revelation. Masood Sharif Khan Khattak on Brigadier Imtiaz Revelation. Brigadier Retd. Imtiaz aka Billa - Former Number 2 of ISI - 1987 - 1989, and Director General Intelligence Bureau under Mian Nawaz Sharif's First Government - 1990 - 1993. The month of August 2009 witnessed a dubious character from the past who had worked in the intelligence apparatus of Pakistan making, on every TV Channel of Pakistan, so-called and unwarranted revelations galore about important political and other events of the eighties and nineties. If those revelations were to go unchallenged the political history of Pakistan would eventually be wrongly interpreted by the historians of the foreseeable future. It is widely suspected that the campaign launched by the dubious intelligence characters of the past was an orchestrated one for sinister purposes. Masood Sharif Khan Khattak, a former Director General Intelligence Bureau (DG IB) from the era in question, was an eye witness to the events of the time period that was being distorted by dubious characters. His name figured in many ways in all the discussions taking place on various TV Channels. Thus, the TV channels of Pakistan had wanted to have his views on different matters. Initially, he desisted from becoming a part to the raging controversies. But after a lot of the recent history had been distorted and had stunned the people of Pakistan Masood Sharif Khan Khattak agreed to give a comprehensive interview to GEO TV Program’s renowned host Mr Salim Safi in order to put matters in their true perspective. The video is the result of that interview which covers all the events of the eighties and nineties that were put in doubt by dubious characters being used in a manipulated campaign meant to hurt the Pakistani Military and Intelligence Establishment and thus weaken Pakistan internally by causing unwarranted fissures. Hmm! Its really interesting , and what a personality that person got!